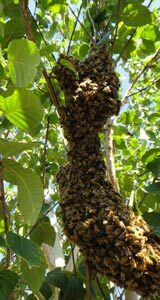 Honey bees normally divide their colony in the Spring- you may find a swarm clinging to a tree or bush in your yard. 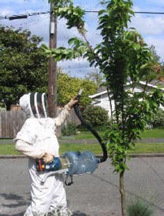 We capture the swarms with a bee vacuum and give them a new home in an apiary. No poisons are used and we do not harm the bees. There is NO CHARGE for this service within 10 miles of our base in the Phinney Ridge Neighborhood. The term “bee” is reserved for bumble bees and the common honey bee, “Apis mellifera”.